This is Power Query in a browser. 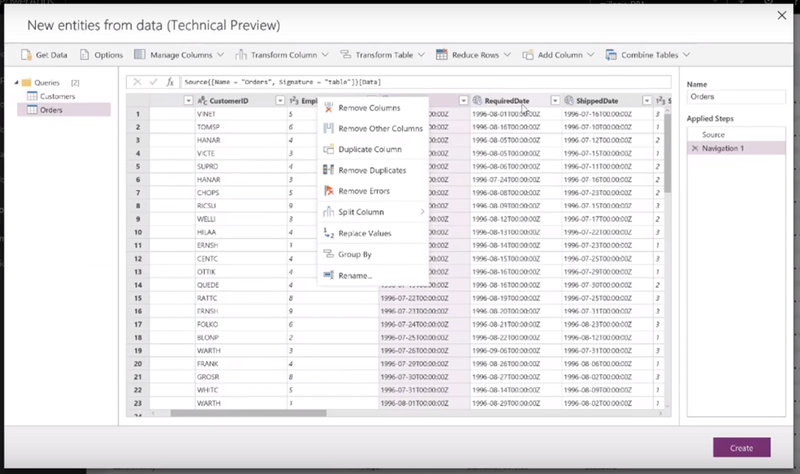 If they can build a web interface for Power Query for CDS, why not for Power BI? It would give us the full power of Power BI Desktop in the browser, on any platform (I know a few people have been asking for Power BI Desktop for Mac), with no tedious manual updating. 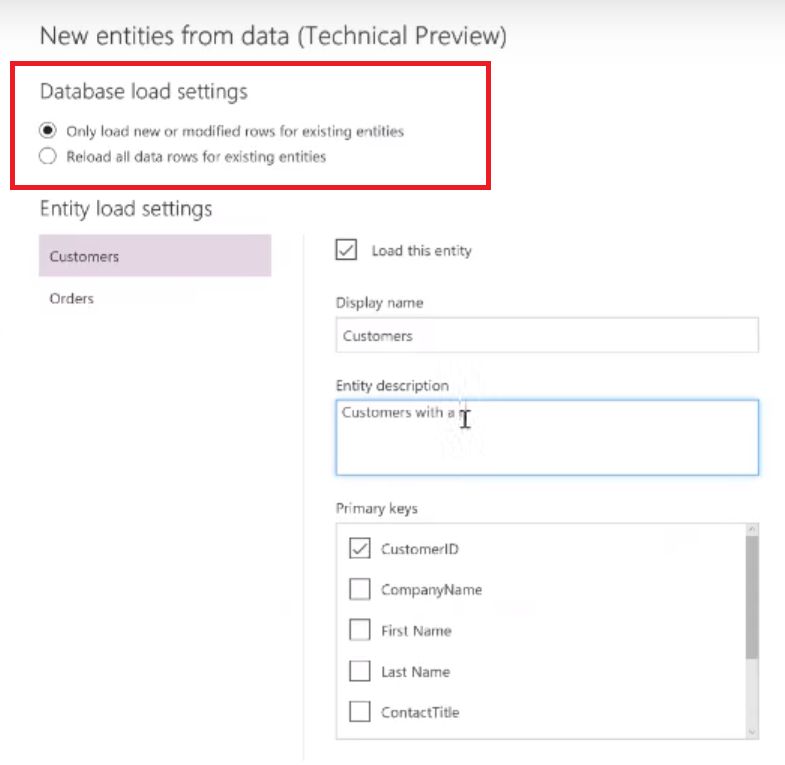 The “Only load new or modified rows for existing entities” options is… incremental load! This makes me wonder whether Power BI users who want incremental load should be using using the CDS as a staging area (a super-simple data warehouse…?) and then connecting Power BI to it? I’ll be honest, I’ve not done anything with the CDS so I can’t really say how useful this new functionality will actually be – and I’ve heard mixed reports about the CDS, if I’m honest. Certainly, as someone (I suspect Meagan), mentions in a question, the only way Power BI can connect to the CDS right now is via DirectQuery and not Import, which seems pretty crazy. Still… I’m very curious and will be paying close attention to how it develops. 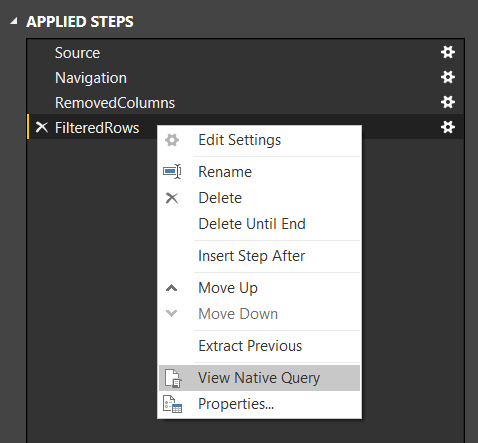 More Power Query in the world can only be a good thing! Last week I had the chance to do something I have not done before: build a Power BI report to be displayed on a big screen hanging on a wall. To make up for the loss of user interactivity, I used the new Drilldown Player custom visual to cycle through different selections and display a new slice of data every few seconds; Devin Knight’s blog post here has a great summary of how to use it. However I wasn’t happy about the look of the Drilldown Player visual in this particular report: the play/stop/pause buttons aren’t much use if you can’t click on them and the visual doesn’t show all of the values that it is cycling through. As a result I hid the visual behind another one and came up with a different way of displaying the currently-displayed selection. Anyway, you can download the report with these animations in here, and view it online here. Have fun! Data combination checks do not occur when accessing multiple data sources from within an extension. Since all data source calls made from within the extension inherit the same authorization context, it is assumed they are “safe” to combine. Your extension will always be treated as a single data source when it comes to data combination rules. Users would still receive the regular privacy prompts when combining your source with other M sources. Those of you who have followed my recent series on this topic, or who have struggled with the Formula.Firewall error, will appreciate how much easier this makes combining data from different sources. Secondly, you have a lot more flexibility when it comes to different types of authentication for web services. As I showed in my session on web services and M at the Data Insights Summit, there are a lot of limitations when it comes to working with web services in Power BI or Excel. Within a custom data connector, however, you can connect to web services that use OAuth for authentication, you can make POST requests to web services that require authentication and you can pass a web API key from the credentials store through an HTTP custom header and not just through a query parameter – none of which are possible in Power BI or Excel. I’m sure there are a lot of other useful bits of functionality or behaviour that are only available in custom data connectors – I know I’ve only just begun to learn what’s possible. Even with what I’ve listed here, though, I get the feeling that there will be a lot of cases where you will have no choice but to build a custom data connector just to be able to access certain data sources, even if you only need to create a single report. 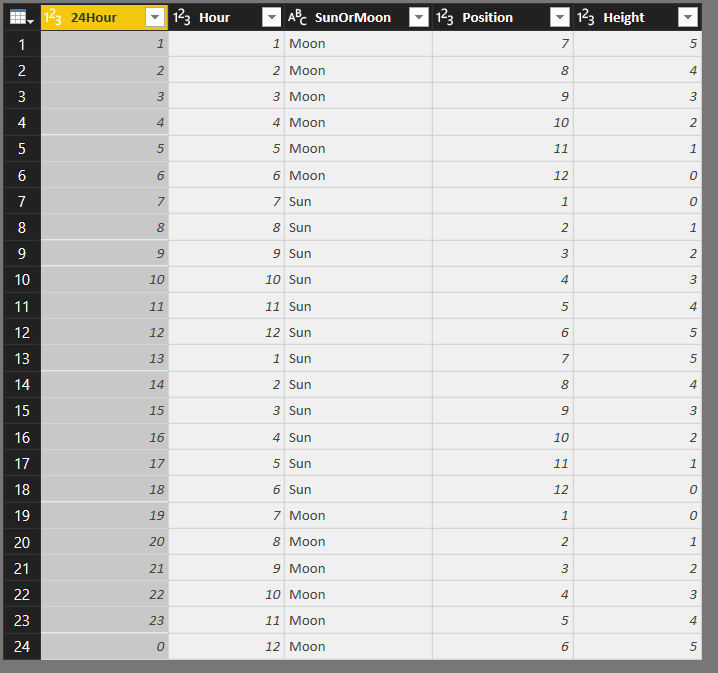 There may also be cases where it’s preferable to build a custom data connector rather than embed lots of complex M code in a Power BI report or Excel workbook, perhaps to make code portability easier. It’s a bit of a pain to have to have Visual Studio and the SDK installed in order to do this, but building a custom data connector is fairly easy if you already know M and the development experience in Visual Studio (with intellisense!) is much better than in the Advanced Query Editor window. Recently I’ve been building a lot of Power BI reports from csv and Excel files, and to make sure that scheduled refresh works I have been setting up data sources in an On Premises Data Gateway (what used to be called the Enterprise Gateway). 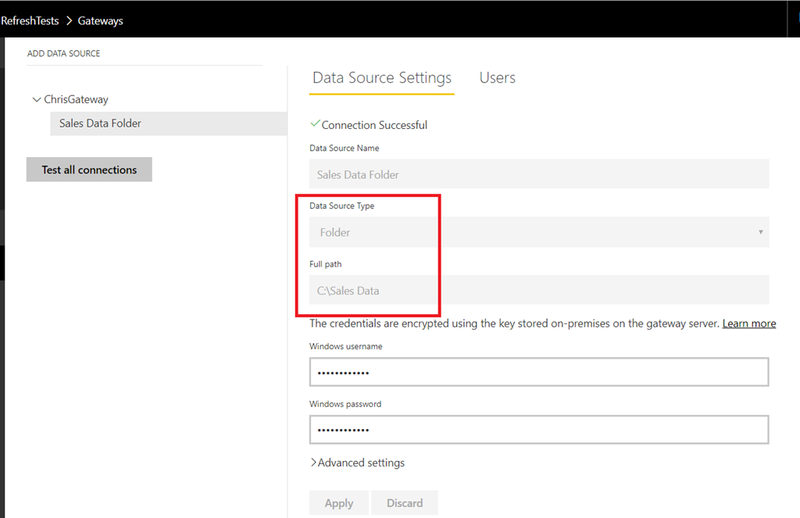 I had assumed that if I was connecting to file-based data sources in my Power BI dataset then, in the gateway, I would need to set up one data source for each file that I’m connecting to – which is a bit of a pain. In fact it turns out that you can set up a gateway data source for the folder that the files are in instead. There’s nothing really to notice here except that the code uses File.Contents() to get the data from a single file – I’m not using Folder.Contents(). Setting up a single gateway data source for a folder is obviously a much better option than setting up multiple data sources for all the files in the folder. Did everyone else know this but me? I guess this is all related to the inheritance of data privacy settings that I blogged about here. Something I didn’t understand at all when I started writing this series was how the “None” data privacy level worked. 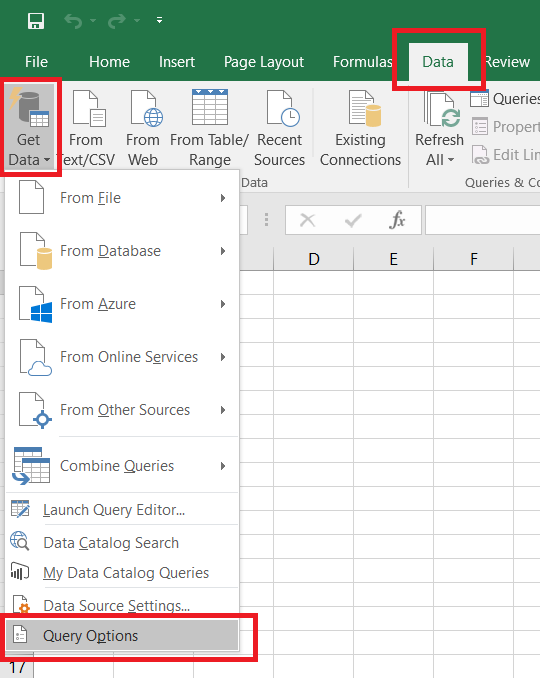 Now, however, the ever- helpful Curt Hagenlocher of the Power Query dev team has explained it to me and in this post I’ll demonstrate how it behaves and show how data privacy levels can be inherited from other data sources. 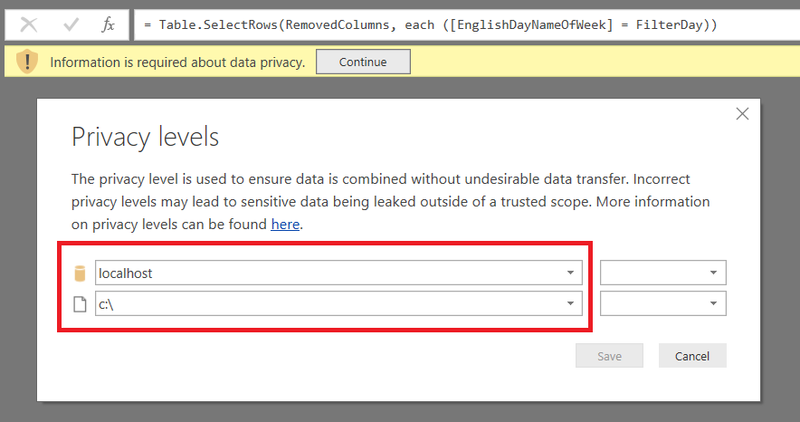 For the SQL Server database you can set the data privacy level at two places: the localhost instance (the default), or the Adventure Works DW database on that instance. For the Excel workbook you get set the data privacy level at three places: the c:\ drive (the default), the folder c:\Data Privacy Demo that the Excel workbook is in, or the Excel workbook itself. However, it behaves as if it has a data privacy level of Public: the second query that gets data from SQL Server runs successfully, query folding still takes place and you are not prompted to set a data privacy level for this data source. Why? The general rule is that the engine looks for permissions for the exact data source that it’s trying to access, and if none are set then it keeps looking for more general permissions until it runs out of places to look. In my opinion, I don’t think the way the “None” privacy level and inheritance works is very clear right now – it makes sense now I’ve had it explained to me, but the UI does nothing to help you understand what’s going on. Luckily it sounds like the dev team are considering some changes to make it more transparent. I would like to see the fact that data privacy levels have been inherited for a data source, and where they have been inherited from, called out in the Edit Permissions dialog. So far in this series (click here for part 1), I have shown how changing the data privacy settings for a data source can affect the performance of queries and even prevent them from executing completely. 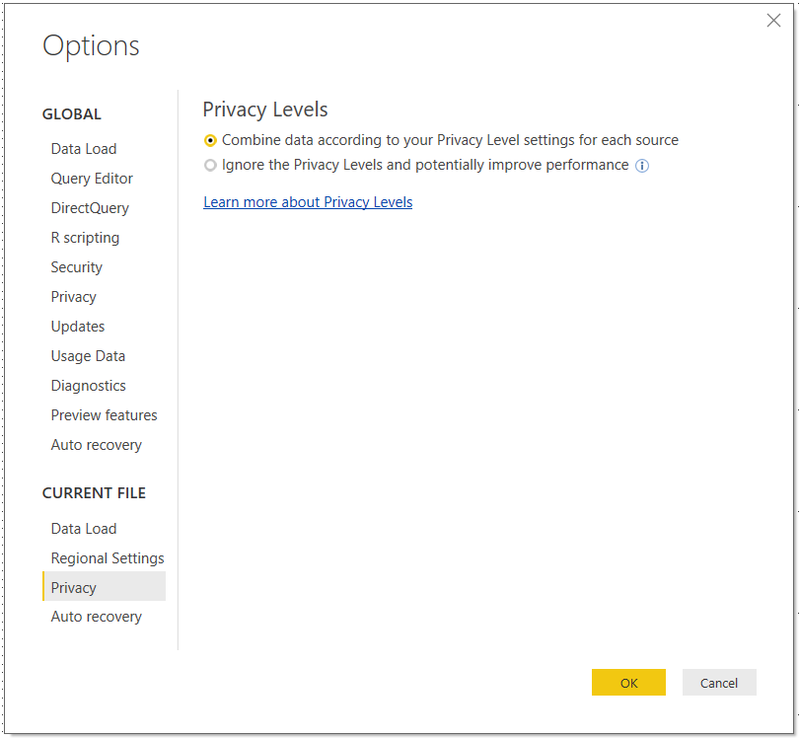 What I haven’t mentioned yet is that you also have the option of disabling data privacy checks completely in Power BI Desktop and Excel. In this post I will show you how you can disable data privacy checks and discuss the pros and cons of doing so. 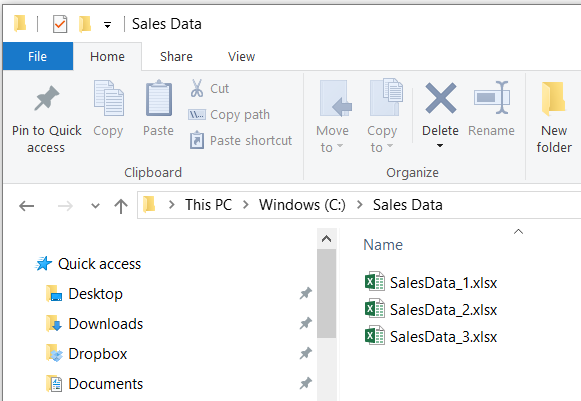 The same settings can be found in Excel 2016 by going to the Data tab, clicking Get Data and then selecting Query Options. In both cases this brings up the Options dialog. Always combine data according to your Privacy Level settings for each source means that data privacy settings are always applied for every .pbix or Excel file you open, regardless of the properties (described below) that you have saved for individual files. Combine data according to each file’s Privacy Level settings means that the properties set on individual .pbix or Excel files control how the data privacy checks are applied. Always ignore Privacy Level settings means that data privacy settings are always ignored, in every .pbix or Excel file you open, regardless of settings saved for individual files. The radio buttons here are greyed out if you have options #1 or #3 selected in the previous pane; it’s only if you have selected option #2, Combine data according to each file’s Privacy Level settings, that these properties are taken into account. You may need to close and reopen the Options dialog if you have changed settings in the previous pane but the radio buttons here remain greyed out. Combine data according to your Privacy Level settings for each source, which means that the data privacy settings that you have set for each data source are used to control how queries that combine data from multiple data sources behave. This is the default setting. Ignore the Privacy Levels and potentially improve performance, which means that data privacy settings are completely ignored when queries combine data from multiple data sources. To sum up, these two groups of properties allow you to choose whether data privacy settings are applied differently for different .pbix or Excel files, or whether, on your PC, they are always applied or always ignored. 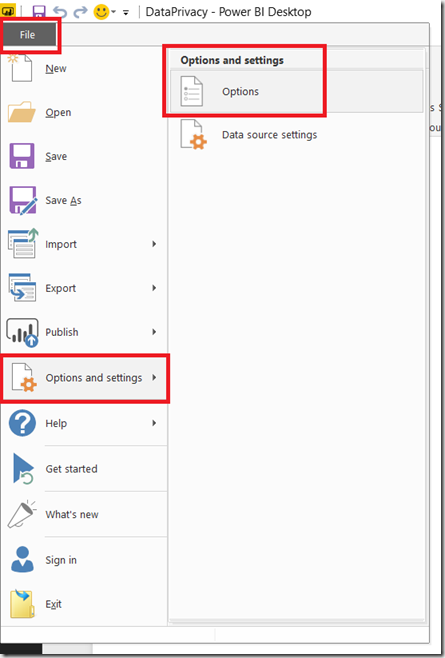 For Power BI users it is important to remember that these settings only apply to Power BI Desktop. 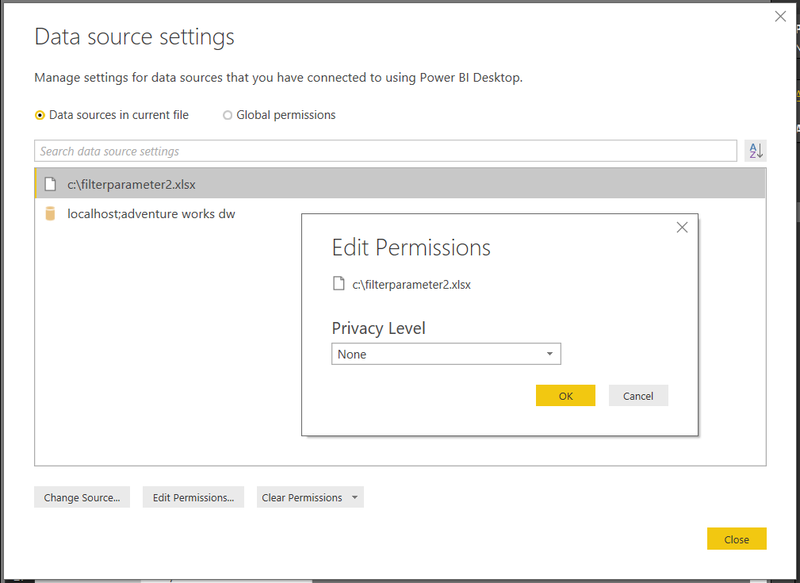 After a report has been published, if you are using the On-Premises Data Gateway, you also need to configure data privacy settings on the data sources used by your dataset in the Power BI portal. If you are using the On-Premises Data Gateway in Personal Mode (what used to be called the Personal Gateway) then you can configure it to ignore data privacy settings as described here. Unfortunately if you are not using Personal Mode (ie you are using what used to be called the Enterprise Gateway, and what is now just called the On-Premises Data Gateway) then at the time of writing there is no way to configure the gateway to ignore data privacy levels. You can vote here to get this changed. It’s also worth mentioning that right now you can’t combine data from online and on-premises data sources in a gateway either, although it sounds like this limitation will be addressed soon. To work around these limitations you have to import data into separate tables in the dataset and then use DAX calculated tables to combine the data instead – a nasty hack I know, but one that I’ve had to implement myself a few times. 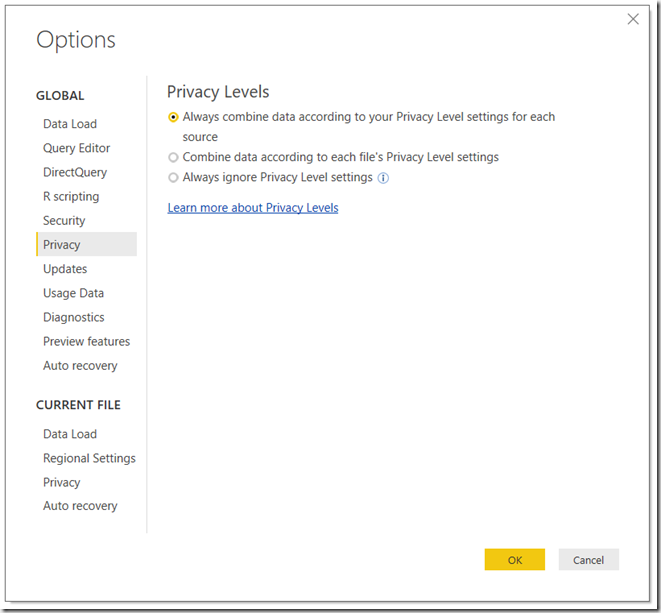 It can be incredibly tempting to avoid the problems associated with data privacy checks by setting Power BI and Excel to ignore them completely. Doing this certainly avoids a lot of headaches and confusion with the Formula.Firewall error message and so on. It also ensures that your queries execute as fast as they can: this is not just because query folding happens whenever possible but because the act of applying the data privacy checks alone can hurt query performance. Recently I saw a case where the only data source used was an Excel workbook (so no query folding was possible) and turning off the data privacy checks made a massive difference to query performance. However, I cannot recommend that you turn off data privacy checks for all your Excel workbooks and .pbix files by default. Firstly, if you are working with sensitive or highly-regulated data, leaving the data privacy checks in place at least forces you to consider the privacy implications of query folding on a case-by-case basis. On the other hand ignoring data privacy checks by default makes it more likely that you or one of your users will create a query that accidentally sends data to an external data source and breaches your organisation’s rules – or even the law – concerning how this data should be handled. 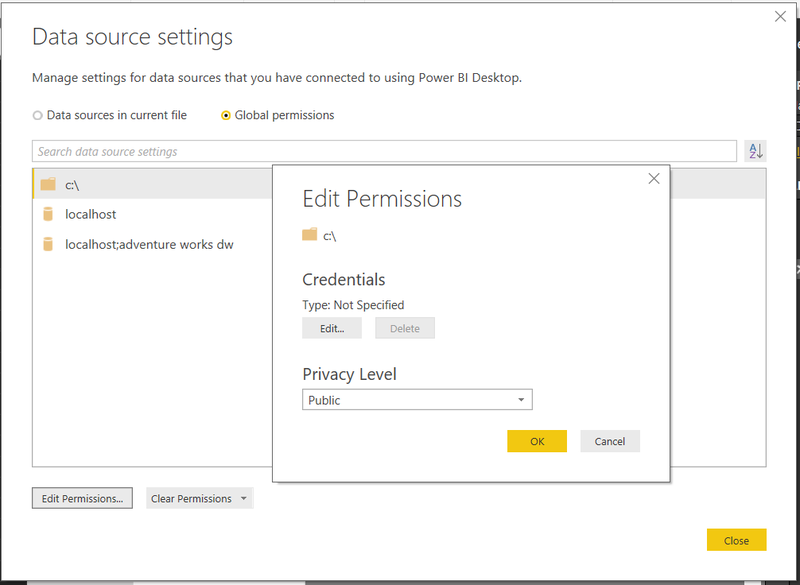 Secondly, if you are a Power BI user and need to use the On-Premises Data Gateway, then you risk creating reports that work fine in Power BI Desktop when the data privacy checks are ignored but which cannot be refreshed after they have been published because the On-Premises Gateway still applies those checks.